This case report describes a geriatric large breed dog with cervical myelopathy and advanced multifocal osteoarthritis. The owner was considering euthanasia when the dog acutely was unable to rise on her own. The patient initially improved with acupuncture focused on neuromodulation for chronic pain, cervical spinal cord compression, and chronic wind up of the sympathetic nervous system. The patient had a second acute episode of pain and inability to rise three weeks into treatment and the owner elected euthanasia. The patient was an 11 year old female spayed Doberman pinscher who was unable to stand on the day she presented. She had an extensive orthopedic history consisting of bilateral cruciate ligament repairs. Years earlier she had a TPLO performed on one knee which she had reportedly done fairly well after. She later had a lateral suture repair of the contralateral knee which failed and the owner did not pursue a second surgery. The reasons the surgery may have failed include surgical skill level, technique or lack of appropriate post operative rehabilitation. Within the last year the owner had noticed a wobbly gait and weakness in all four limbs. The referring veterinarian had recommended an MRI, acupuncture and physical rehabilitation, which the owner declined at the time due to financial and scheduling difficulties. The patient had been treated with intermittent NSAIDS for her stifle osteoarthritis since the surgeries. On the night of presentation, the owner reported the dog had been down and unable to rise on her own all day. The day prior there were workers working on the outside of the house which the owner believed had caused her significant stress. When she returned home she found the pet had chewed and torn up a large piece of a carpet and some wood trim on the walls. Since then she had not wanted to rise on her own, and had urinated on her bed. The owner was concerned that she was painful and called for a house call euthanasia. On initial evaluation we were able to get her up with the assistance of a harness, and get her slowly walking once off slippery wood flooring. We were able to guide her outside and she urinated on her own. On initial presentation the pet was bright, alert, responsive and well hydrated. Her eyes and ears were clear and her oral examination was negative. Her peripheral lymph nodes were normal size and texture. Her heart rate was 100 with a regular rhythm, no heart murmur was noted and her pulses were strong and synchronous. Her abdomen was tense, no localizable pain and no obvious masses were palpated. Her body condition score was 6/9 with some muscle wasting of the hind legs. Once she was assisted to a standing position she was ambulatory in all four limbs. Her gait was stiff and stilted. She was tetraparetic, with mild ataxia in the forelimbs and moderate ataxia in the hindlimbs. She had a “two engine” gait, where her front limbs move quicker and with a more choppy gait than her rear limbs. This is indicative of a lower cervical myelopathy. She was carrying her head low with a marked reduction in cervical active range of motion. Her stifles were thickened with medial buttress bilaterally. Neurologic exam revealed slow conscious proprioception in all limbs, worse in the rear. She had crossed extensor reflexes in her hind limbs. Her patellar reflexes were hyperreflexive. I neglected to assess her forelimb reflexes. A more thorough examination may have revealed hyperreflexia and crossed extensors. Myofascial exam revealed marked taut bands in the lateral cervical muscles. There was a marked local twitch response along the cervical and thoracic spine. There were two trigger points noted between the shoulder blades, and she was sensitive on palpation of caudal lumbar muscles. Differentials for neck pain and tetraparesis: cervical spondylomyelopathy, steroid responsive meningitis, degenerative disk disease, ischemic myelopathy, neoplasia or trauma. Differentials for thickened stifles: osteoarthritis, chronic cruciate ligament ruptures, medial meniscus injury, patellar luxation, osteosarcoma, intraarticular neoplasia. There was no definitive diagnosis as the owners declined any diagnostics. The suspected diagnoses based on breed, exam, neurologic deficits, and progression of clinical signs were cervical spondylomyelopathy with chronic cruciate ligament ruptures and secondary osteoarthritis. The cervical spondylomyelopathy may have developed over several years. The bilateral stifle surgeries most likely played a significant role. Years of gait abnormalities and shifting weight forward would have placed increased stress on the cervical spine and muscles. The owner was very concerned with the pet’s level of pain and the fact that she would be home alone for up to 10 hours during the day. She did not want to come home to find her down and stressed. The owner’s goals were to minimize pain and have her be able to get up and move on her own. If we could not maintain her with that level of quality of life the owner would elect euthanasia. As this was a hospice case, no further diagnostics were done. Acupuncture had the potential to provide numerous benefits for this patient and help provide the level of comfort and mobility the owner was looking for. The patient had some degree of chronic pain and thus autonomic dysfunction as a result of multiple stifle injuries and incomplete healing. This would lead to increased sympathetic tone and possibly some loss of limb awareness or conscious proprioception. A combination of local, central, and autonomic points were selected based on history, known neurophysiology and guided by the myofascial examination. GV 20, 14, 4; Bai Hui; BL 10, 13, 14, 15, 21, 22, 23, 54, 60; GB 21, 29, 30; SI 11, 12; ST 34, 36; SP 6. An Assisi loop was laced around her neck for a 15 minute treatment after finishing the acupuncture treatment. This protocol was developed to address local, central and autonomic dysfunction caused by the patients’ neurologic and orthopedic disease, as well as increased sympathetic tone. Local points such as BL points and cervical points along the omotransversarius muscle along the neck provided feedback to the cervical spine. Central points such as ST 36 were selected to balance the autonomic nervous system by stimulating the nucleus tractus solitaris and stimulating cross talk with the vagus nucleus. Highly autonomic points were selected in addition to ST 36 such as GV 20, GV 14, GV 4 and Bai Hui . 5/9/18 Acupuncture treatment #2 Using 0.20 x 30 (Blue) Seirin needles – all points were bilateral except for hindlimb points done on the left due to positioning of patient. GV 20, 14, 4; Bai Hui; BL 10, 13, 14, 15, 21, 22, 23, 54, 60; ST 34, 36; SP 6; SI 11, 12; GB 21, 29, 30; Cervical spinal points 4 placed on each side, 2 in trigger points. Electroacupuncture – BL 21-23 and BL 15-21 (Pantheon 4cPro unit – mixed frequency 2/100 Hz, power level 1 x 15 minute treatment.) An Assisi loop was laced around her neck for 15 minute treatment after finishing the acupuncture treatment. 5/12/18 Acupuncture Treatment #3 Using 0.2 x 30 (Blue) Seirin needles – all points bilateral except for hindlimb points done on the right side due to positioning of patient. GV 20, 14, 4; Bai Hui; BL 10, 13, 14, 15, 21, 22, 23, 54, 60; ST 34, 36; SP 6; SI 11, 12; GB 21, 29, 30; Cervical spinal trigger points three placed on each side, Hua-tuo-jia-ji 4 points placed on each side of the neck. Electroacupuncture – Placed on cranial and caudal Hua-tuo-jia-ji points bilaterally on the neck, mixed frequency 2/100 Hz, power level 1 x 15 minute. Owner had purchased her own Assisi loop by this time and had been using it daily for the last 2 days. GV 20, 14, 4; LI 11; Bai Hui; BL 10, 13, 14, 15, 21, 22, 23, 54, 60; ST 34, 36; SP 10; KI 3; SI 11, 12; GB 21, 29, 30; Cervical spinal points 3 placed on each side, Hua-tuo-jia-ji, 3 points placed on each side of the neck. EAP – mixed frequency 4/100 Hz x 15 minutes on cervical spinal points bilaterally. 5/24/18 Acupuncture treatment #5 – Using 0.2 (Blue) x 30 Seirin needles and Carbo 0.2 x 25 mm at EAP points. GV 20, 14, 4; LI 11; Bai Hui; BL 10, 13, 14, 15, 21, 22, 23, 54, 60; ST 34, 36; SP 10; KI 3; SI 11, 12; GB 21, 29, 30; Cervical spinal points 3 placed on each side, Hua-tuo-jia-ji, 3 points placed on trigger points and taut bands each side of the neck. EAP – mixed frequency 4/100 Hz x 15 minutes on cervical spinal points bilaterally. She was also continued on her current anti inflammatory medication Metacam. Gabapentin, omega 3 FA and Dasuquin were added in for additional support. 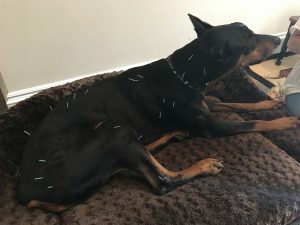 Although the owner was initially hesitant to pursue acupuncture, she did report an improvement in the patients comfort following the first treatment. She was able to rise with less assistance, and had improved mobility and cervical active range of motion. There is evidence that acupuncture can provide analgesia and improve neck mobility in people with chronic cervical myofascial dysfunction. (Pain intensity and cervical range of motion in women with myofascial pain treated with acupuncture and electroacupuncture: a double-blinded, randomized clinical trial; Maria F. M. Aranha, et al. Braz J Phys Ther. 2015 Jan-Feb; 19(1):34-43). She continued to mildly improve following subsequent treatments. Although her gait did not improve dramatically, her level of pain decreased and her quality of life increased, which was the owner’s main goal. For instance, with her increased mobility she was once again able to follow the cleaning person around the house without the same level of exhaustion and stress she had been having. The pet seemed to be less stressed by the ongoing work on the outside of the house. 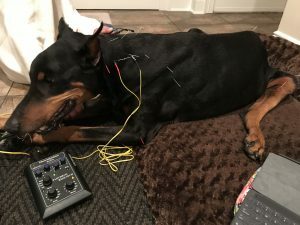 The owner felt her overall stress level was improved by the acupuncture treatments. Acupuncture can lower a patients stress level by neuromodulating pain as well as by impacting the autonomic nervous system. (Effects of acupuncture on the heart rate variability, cortisol levels and behavioral response induced by thunder sound in beagles; Maccariello CEM, Physiol Behav, 2018 Mar 15; 186:37-44). In addition to acupuncture, the Assisi loop may have played an important part in improving the patient’s comfort. The owner had started using the loop daily at home to reduce cervical inflammation and pain. Pulsed electromagnetic field therapy can improve comfort and function by providing analgesia, as well as decrease edema and improve circulation. (Evaluation of pulsed electromagnetic field therapy for the treatment of chronic postoperative pain following lumbar surgery: a pilot, double-blind, randomized, sham-controlled clinical trial; Sorrell RG, J Pain Res 2018 June 22; 11:1209-1222). Laser therapy may have benefited this patient as it would have decreased muscle pain and tension in the cervical region as well as helping nerves recover. Another option would have been an LED unit for the owner to use at home. These units are easy to use and this therapy may promote healing. Unfortunately, due to the cost of the treatments and the owner’s schedule, she was unable to continue twice weekly house calls. With once weekly treatments she once again began to decline. The owner called on 5/29/18 and reported that the pet was once again acutely down, panting, and seemed agitated and painful. At that time the owner decided not to pursue further treatment and elected humane euthanasia at home. The owner was very thankful for the additional weeks she had with her pet and felt there was good quality of life during that time. This case was very rewarding despite the outcome of euthanasia because the owner was given more quality time with her beloved pet.